Item as described fast delivery thanks!! Arrived quickly, as described, in excellent condition. Thanks! Very Fast shipping. Item as described. Will do business again. I'm happy!!! 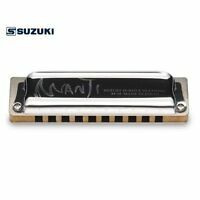 Good beginner harmonicas. Needs break-in or gap set up though. Great seller. My son loves his Harmonicas. 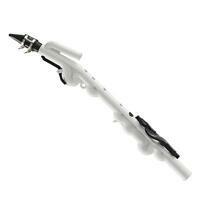 They sound great and are easy to disassemble and clean when needed. I confused the name of this instrument with another of Hohner's products but, that was my own fault. I find these harps to be very hard to blow and especially hard to draw/breath in, especially when compared to my old Marine Band Harmonicas. Pitch is not good on a couple of them. They have a very breathy sound, overall. I opened up the F harp to see if there was anything I could do to improve their response but, no amount of changing the gap made any difference. The comb is not designed to make it easy to level. I will say the case is easily worth $25 so, it isn't a complete waste of money. My intention now is to gradually change out the harps for a better model or brand and just keep the case. I might eventually give these to a child who doesn't have anything to compare them to and just wants something with which to make noise. 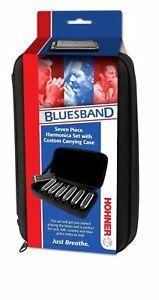 For an adult or young student who is serious about playing the harmonica I suggest you bite the bullet and purchase something better. Hohner certainly makes some better models or even a different manufacturer. I love playing and enjoyed this set, but it's just pretty junky. Harps lose tune quickly and some may come not ready to play out of the box. I needed to reset multiple gaps on two of the harps because they came either too open or closed. Not a big deal but be very careful when adjusting these because it doesn't take much to snap a tab off. Besides that I can play pretty much whatever with this kit. Great for someone getting their toes wet! Bought this set for the range of keys. Come in nice padded case. Hadn't blown a harp for 30 years, so this was putting my toe back in the water. My previous experience was on a Hohner MB and Echo. Either of which could blow or draw with little effort. All of the harps seem to have nice finish and have screw on covers. This is where the pleasantries end. I played through all of the keys both blows and draws. My G Harp 3 blow (D) fails to make noise. A number of draws are very stiff, requiring too much air to cause vibration. Several of the blows are stiff as well. Very little bend is achievable, and only on a few reeds among the seven harmonicas. After playing only a few minutes, I was nearly hyperventilated trying to make consistent sound volume. I play bass in a jam band, and was hoping to add a new sound to the group. Guess I will have to step up my price point. If you want a wide range of sound, these are great. If you want intonation, soft and loud, and are looking at something for jamming or recording, then these should be overlooked. These harmonicas are very well built. Its my first set and I am enjoying them. I highly recommend these for anyone wanting to learn harmonica.